Are you in school? Do you teach school? Do you have family members in school? Are you experiencing (or have you experienced) strange, remarkable, and/or amusing things related to school? Or do you just like reading and taking about other people's school experiences? That feeling when a student who has spent the entire year screwing around in class is suddenly interested in passing because he needs good grades to be eligible for the soccer team. That feeling when the school sets up an online portal for grades so you can see your kid's progress in real time, but the teachers don't update it, thus defeating the purpose. In my own defense, I was out ill most of last week. That feeling you get when you've been struggling all year to motivate your students, spark some passion for learning in them, and feel like you're just not reaching them... and then one of them tells you that they really liked being in your class and that they learned something, and thanks you for caring. Makes all the rest worthwhile. I was discussing this very thing with some other science teachers last week. One of my happiest moments was when one of my former students--now agonist ready to graduate with a degree in chemistry--told me, "Before I took your class, I was going to be an English major." If by "school sets up" you mean "some administrator who'll never have to try using the kluge-ridden abortion of bad UI misfeatures, allows himself to be persuaded by sexual favors from sales staff into commiting his institution to spending six-digit sums in buying said abortion, which is so hopelessly unworkable people would rather grade freshman physics labs than make another try at the 'user's guide', which is really just the marketing video clip with no operational details present", then you're on the right track. I'm looking at you, Starfish, and may someone pour molten rubidium by the kilogram in the ventral orifices of everyone responsible for that afterbirth-of-Ewoks. Please keep your fetishes to yourself, Mr. Badger, or we'll be forced to send you to Principal Wicket's office. I will soon begin earning my BA. I see you've forgotten that we issue assault rifles to teachers in America now. Do you have any last requests? I have one. Could you hang onto his pelt for me afterward? I could use a new winter hat. "I'm sorry, Mr. Pariah, but standard Forum Topic Insurance does not cover Badger infestation. Would you like to upgrade to premium to cover future occurrences?" Edit: You should know that my tough badger skin turns bullet and blaster proof in the midst of Berserker Ewok Fury. Well, it was Cancer's fault, you cant mention the species that shall not be named around me without some chaos. Now I am going to go back to my nap at the back of the class. The only thing surprising about this turn of events is that I'm actually surprised by it. This is why I always spray my threads with badger repellant. Hampshire College has promoted a brainless slime mold to its faculty. 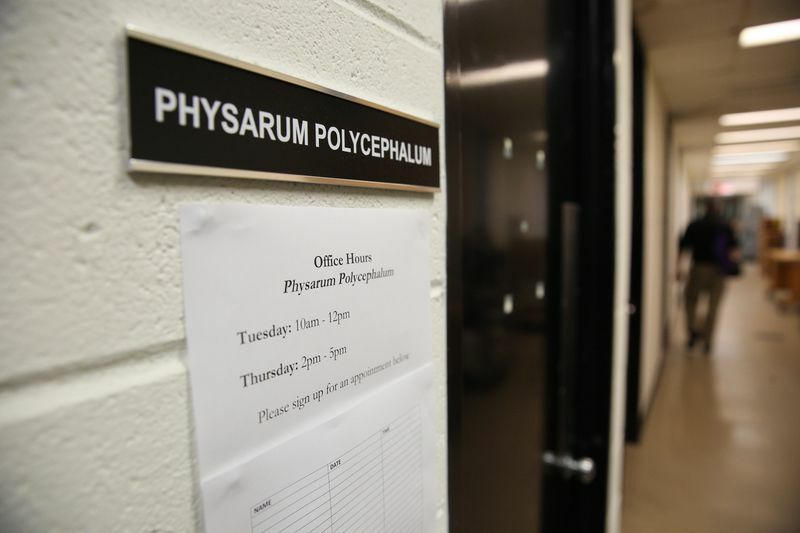 The slime mold holds office hours, and the Hampshire students who work in the lab are its research assistants (yes, they are ones assisting the slime mold). When the school held a symposium on March 1 to present the slime molds’ work, they put out wine and cheese for the human guests and oats for the slime mold. He sounds like a 'fun guy'. Slime molds demonstrate capacity for learning, despite having no brain. "All right, class ... what's your excuse?" Maybe I can make students understand electric potential by HOOKING THEIR GONADS UP TO 50000 VOLTS AND LETTING THEM HAVE IT WHEN THEY GUESS WRONG.